Volunteers clean up after a devastating flood. 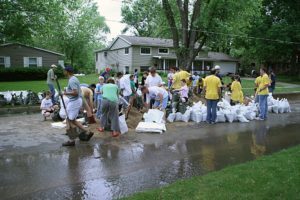 You may be able to register with your local volunteer center or government agency for assistance from voluntary organizations active in disaster through VOADs or Hands On Network. You can also seek out help from your social media networks, community bulletin boards, and Craigslist. In some cases, volunteers will be from established voluntary organizations and trained. Often, they will be family members, friends, or people who show up with lots of energy and good intentions. Well-trained volunteers from established agencies will often be able to help lead you through the process, but will still need your guidance on what you think you can save, procedures for handling your work without damaging it, and what particular hazards may be present in your studio. Spontaneous volunteers may need much more direction from you. It may also be up to you to make sure they work safely, wear the proper protective gear, and have guidance on what needs to be done, and in what order. Some volunteers may only be available early in the recovery and are often on their own schedules – so you may have to adjust your plans in order to take full advantage of their help. Accept help graciously, knowing that the volunteers desire to help you and that you would do the same for them if the situation was reversed. Many post-disaster volunteers come from faith-based groups and may have prayers or principles that they engage in during their service. If you think there is the possibility of a conflict with your own beliefs, it may be worthwhile to discuss that beforehand. Hopefully, most organized volunteer groups will be able to respect your wishes. Stained glass artist Patrick Clark and volunteers help with his studio clean-up. You and your studio mates or employees will probably have to become supervisors. In some cases, you may have volunteers who are able to assume a supervisory role. Identify those people and any special skills they may have. Set up schedules and divide tasks. Determine volunteers abilities and determine if they have special skills that can be put to use. For example: artists may have a special affinity for salvaging your work; mechanically inclined persons may be put to use cleaning or salvaging tools or equipment. Store items to be salvaged, and/or perform conservation, clean-up/stabilization tasks, or ready for transport to another location to be salvaged. Revisit your work plan periodically. Check off what has been done, and adjust your tasks and priorities as needed. Try to keep things as organized as possible. Work hard, but pace yourself. As several artists have said, “it is a marathon, not a sprint.” Be sure to take regular breaks, drink liquids, and eat regularly. Take time to grieve for your losses, and also to enjoy the company of those who came out to help you. Try to make recovery as positive an experience as you can. Encourage your volunteers to do the same and to have a positive experience. Don’t push yourself too hard. Rest when you need it. Take extra time to think through tasks that may be hazardous. People working in this environment are under stress and are usually operating at less than optimal cognitive capacity. Be especially careful when using ladders or working around machinery. Do not complicate your recovery with an injury. Take time for yourself. Spend some quality time with family, friends, and pets, away from the worksite. Make some time for yourself. You will make up the time by being less stressed, more rested, and more alert. Volunteers who are working on your property may be exposed to certain hazards. If you have business liability coverage, check with your insurance carrier to be sure you are covered if someone is injured. Volunteers working with a volunteer agency usually sign a liability waiver, but ask the agency about liability if something goes wrong. If you are working with volunteers, do not provide anything that could be construed as compensation for their work. Doing so may legally change your relationship to employer/employee with more serious liability consequences. Liability Waivers: Volunteer Lawyers and Professionals for the Arts of Nashville, TN has sample release forms you may use with volunteers. Fill in something like “Disaster Relief” as the program, and your name or business name as the organization. These are in TXT format so you can copy into your word processor and add your own modifications before printing. Glass Artist + Beneficiary Ricky Bernstein and volunteers helped to rebuild his studio after a fire. 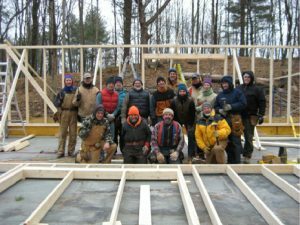 Consider working with an established volunteer organization. Volunteers who are trained in advance are the gold standard, but there are many opportunities for untrained volunteers to work under the supervision of those who have been trained in emergency response. Wear protective clothing and bring your own protective gear. Research what gear, supplies, and tools you are likely to need and be sure you have what you need to work safely, without being a burden on the people you are trying to help. Bring extra gear if you can to share with other volunteers. Bring your own water and food, and if possible, bring extra to share if it is needed. In addition to helping prepare for disaster, the Studio Protector Wall Guide is a good guide for artists who are assisting others after emergencies. Be respectful of others’ religious beliefs if you are volunteering as part of a ministry or religious group, refrain from proselytizing or engaging in activities that may add to the stress of those you are trying to help. Do not accept gifts or compensation for your assistance. Doing so may put those you are assisting in a difficult legal position. The work is its own reward. Print this PDF file Tips for Volunteers to hand out to volunteers.